Umpqua National Forest vicinity map. Umpqua National Forest, in southern Oregon's Cascade Range, covers an area of 983,129 acres (3,978.58 km2) in Douglas, Lane, and Jackson counties, and borders Crater Lake National Park. The four ranger districts for the forest are the Cottage Grove, Diamond Lake, North Umpqua, and Tiller ranger districts. The forest is managed by the United States Forest Service, headquartered in Roseburg. Stands of western hemlock, true fir, Douglas-fir and cedar transition to lower-elevation forests of mixed conifers and hardwoods. Timbered valleys of old-growth ponderosa and groves of oak separate mountains like the 9,182-foot (2,799 m) Mount Thielsen and the 8,363-foot (2,549 m) Mount Bailey. Notable geologic features include volcanic basalt and andesite monolithic spires with descriptive names like Eagle Rock, Rattlesnake Rock, and Old Man. Ancestors of the Umpqua, Southern Molala, Yoncalla, and Cow Creek Band of Umpqua Tribe of Indians lived here before Mount Mazama erupted forming Crater Lake nearly 7,000 years ago. The Indians were moved to reservations in 1856. As Europeans bought reservation lands, the tribes further fragmented to become farmers and ranchers in the Umpqua Valley. Two translations of the word "umpqua" are "thundering waters" and "across the waters". The Umpqua National Forest was created by the United States Congress on July 2, 1907. The Forest Service staff soon began building trails, constructing bridges, fighting fires, monitoring grazing, and erecting lookouts. Logging and mining began in 1925. The Civilian Conservation Corps was active in the Umpqua National Forest by building roads, bridges and recreation facilities in the 1930s. The Umpqua National Forest is home to more than 250 wildlife species. Large mammals such as elk, deer, black bear, and cougar, as well as the smaller residents, squirrels, fox, raccoons, and bats are supported by the diverse forest habitats. Raptors such as owls, eagles, osprey, and even peregrine falcons can occasionally be seen in the forest. Coho and Chinook salmon and steelhead, rainbow, brown and cutthroat trout swim, feed and spawn in the rivers and streams of the forest. A 1993 Forest Service study estimated that the extent of old growth in the forest was 535,300 acres (216,600 ha), 82,200 acres (33,300 ha) of which were mountain hemlock (Tsuga mertensiana) forests. In 1988, the Oregon Omnibus Wild and Scenic Rivers Act designated a portion of the North Umpqua River as Wild and Scenic. Twenty-six miles of the river run through the forest. The Rogue-Umpqua National Scenic Byway extends 172 miles (277 km) through the Rogue River–Siskiyou and Umpqua national forests, as well as the Medford and Roseburg districts of the Bureau of Land Management and private lands. Map of wilderness areas in the Umpqua National Forest. Boulder Creek is a 19,100-acre (77 km2) wilderness area located 50 miles (80 km) east of Roseburg. One popular area in Boulder Creek is Pine Bench. A flat area overlooking Boulder Creek, Pine Bench is home to a grove of majestic old growth ponderosa pines. In 1996 the Spring Fire burned 16,500 acres (67 km2) in the Boulder Creek Wilderness. The Rogue-Umpqua Divide is a 33,000-acre (130 km2) wilderness area, 26,350 acres (106.6 km2) of which is inside the National Forest. (About 17% of it lies within Rogue River–Siskiyou National Forest.) Located 80 miles (130 km) east of Roseburg, the Rogue-Umpqua Divide ranges in elevation from 3,200 to 6,878 feet (2,096 m) and separates the drainages of the Rogue and Umpqua rivers. The wilderness includes sub-alpine meadows and old-growth forests. Mount Thielsen is a 55,100-acre (223 km2) wilderness area, 21,593 acres (87.38 km2) of which is located inside the National Forest. (The rest lies in either Winema National Forest or Deschutes National Forest.) Located 80 miles (130 km) east of Roseburg, this wilderness area is the largest in the Umpqua. The 9,182-foot (2,799 m) Mt. Thielsen was born of the same volcanic activity that created Crater Lake and some trails pass over deep pumice that was deposited when Mt. Mazama erupted. The Pacific Crest Trail passes through the middle of the wilderness area. ^ "Land Areas of the National Forest System" (PDF). U.S. Forest Service. January 2012. Retrieved June 30, 2012. ^ "The National Forests of the United States" (PDF). ForestHistory.org. Archived from the original (PDF) on February 21, 2013. Retrieved July 30, 2012. ^ About the Umpqua National Forest from the US Forest Service. 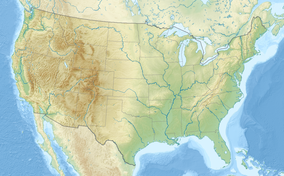 Wikimedia Commons has media related to Umpqua National Forest.